Rajendra Trivedi, speaker of the Gujarat Assembly while speaking at the ‘Mega Brahmin Business Summit’ in Gandhinagar on 29 April added himself to the hall of infamy with his comments that Ambedkar was a Brahman. He thought that he was making a profound comment but it is as brain-dead as any of the loud-mouthed comments of the galaxy of party men such as union minister Anant Kumar Hegde, Haryana minister Anil Vij, union minister Kiren Rijiju, union minister Giriraj Singh, union minister Giriraj Singh, former Uttarakhand chief minister Ramesh Pokhriyal Nishank, lawmaker Sakshi Maharaj, union minister Sadhvi Niranjan Jyoti, chief minister of Tripura Biplab Deb, governor of Tripura Tathagat Roy, union minister of state for HRD, Satyapal Singh just to randomly name a few from a seemingly unending list, not to forget Narendra Modi himself. Every other person from the Sangh Pariwar either utters a lie or stupidity. By the criterion Trivedi devised for determine the brahmanhood of a person, the entire tribe belonging to Sangh Pariwar may have to be called the untouchables for their stupidity. None doubts Ambedkar’s scholarship and hence Trivedi need not belabor to give him a certificate. That work was done by the institutions like Columbia University and London University 100 years ago. It is only brahmanic arrogance that persons like him should speak in evaluative terms about Dr Ambedkar. Even speaking about the RSS, Trivedi’s ideological parent, Ambedkar was a Brahmin way back in 1980s when he was included in the list of its pratahsmaraniya. And there was a strategic blitzkrieg launched to show him in saffron colour. They said that he and Hedgewars were great friends; that Ambedkar was great praise for the RSS shakhas, that he was the greatest Hindu and so on, dexterously mixing complete lies with half truths. They may have succeeded in wooing gullible Dalit masses and self seeking Dalit leaders, but the fact remains that even they know the problematic of appropriating Ambedkar. If any Indian represented complete antithesis of the Sangh Pariwar’s hindutva, it would only be Dr Ambedkar. And Trivedi has temerity to undermine Ambedkar by clubbing him with Modi as knowledgeable people to qualify as Brahmins. Ambedkar surely was one of the most educated persons of his times whereas there have been controversies about Modi’s shady degrees as claimed by him. Can there be comparison between the two? Ambedkar was a great rationalist and valorized scientific temper as he saw them as the fundamental scaffolding of democracy. The basic fact of being a pracharak of the RSS that is founded on irrationality of ancient glory of imagined India might disqualify him to stand by Ambedkar. Modi distinguished himself as the first prime minister to endorse the Hindu nationalists’ longstanding irrational claims that many discoveries of modern science and technology were known to the people of ancient India (sic). In October 2014, while speaking before a gathering of doctors and other professionals at a hospital in Mumbai, he had said, “We all read about Karna in the Mahabharata. If we think a little more, we realise that the Mahabharata says Karna was not born from his mother’s womb. This means that genetic science was present at that time. That is why Karna could be born outside his mother’s womb.” Perhaps this vestige of knowledge impressed Trivedi to see Modi as Brahmin in the company of Dr Ambedkar. But that is precisely the stupidity of the people of Trivedi’s ilk. They do not know that Ambedkar was a great democrat, whereas Modi is a aspiring fascist. Trivedi must know that there is not an iota of comparability between Ambedkar and Modi. 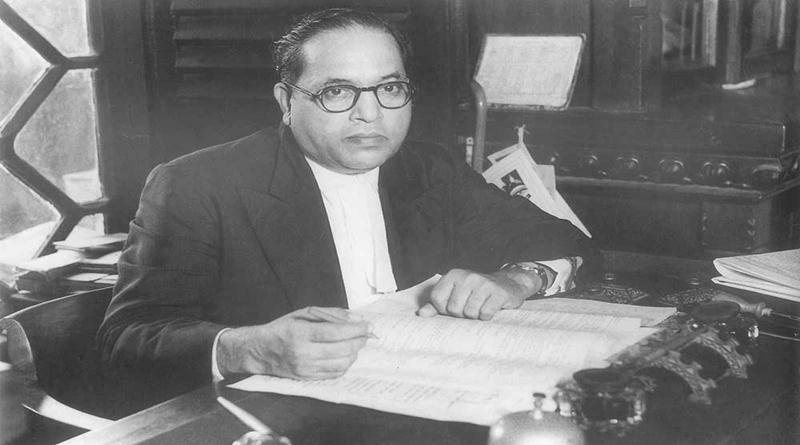 Perhaps it is too much to expect from Trivedi to understand that Ambedkar did not aspire to be a Brahmin; he wanted to annihilate castes that created these poisonous identities. He relentlessly attacked Brahmanism, the ideology of hegemonic Brahmins, not the people of that caste. This attack culminated into his conversion to the Buddhism that historically stood a strong challenge to Brahmanism. Even to this day, Buddhism represents the religious and ideological alternative to the latter. As he spattered his wisdom before the bunch of Brahmins in Gandhinagar, the 300 Dalits of Una, were renouncing Hinduism and embracing Buddhism at Mota Samdhiala that reminded of the flogging of a Dalit family for flaying dead cattle by the self-appointed Gau Rakshaks. They have spoken out their annoyance with the BJP that none of the promises made by its functionaries were fulfilled. Such frustration of Dalits is pervasive during the BJP’s misrule. Trivedi’s speaking before the caste based organization and invoking superiority of Brahmans, howsoever, polished, is abominable. Trivedi-like people help uncover the casteist core of the Sangh Pariwar. The essence of caste is hierarchy and speaking of it in any form is casteism. All upper caste people claim that they never believe in caste but at the same time would never forget to mention that they belonged to the upper caste. This is worse kind of casteism than that manifested by a caste atrocity. What does Trivedi mean by making Ambedkar Brahmin? Actually, it means that Dalits are lower than Brahmins. Interestingly, Trivedi did not stop at only Modi or Ambedkar. He went even to distribute caste certificates to his gods: Ram as a Kshtriya and Krishna as an OBC (Other Backward Caste). Despite Ambedkar’s accomplishments, he remains in need of such epithets. Howsoever, the BJP pour in crores of rupees of public money to grandly memorialize Ambedkar in one-upmanship over the Congress and mesmerize gullible Dalits, the underscoring point is to stress BJP’s brahmanic superiority that it could grant greatness to Ambedkar. It is the age-old stratagem of Brahminism to deify someone to suppress her tribe. It made woman a goddess and worshipped her in order to subjugate women to a subhuman level. Today it deifies Ambedkar to crush Dalits to pulp. Whether it is drastic reduction in the component plan provisions in successive budgets, reduction in scholarships, denial of reservations, killing of Rohith Vemula, flogging of Dalits, blatantly unlawful incarceration of Chandrashekhar Azad of Bhim Army, killing of Dalits with impunity or the galloping rise in incidence of atrocities, the suppression of Dalits is inversely proportional to the deification of Ambedkar. If Trivedi honestly wants to invoke caste idiom, he should not be patronizing in assigning brahmanhood to others to extol superiority of his caste; he should rather accept dalithood for himself and renounce the lofty position he occupies today. Anand Teltumbde is general secretary, CPDR and author of currently selling Republic of Caste. Dr.Anand I am really impressed by your views towards the correction of mental aproach towards Dalits of India. In India, still after 76 years peoples mind set has not been changed towards equal citizen, attitude, abominable conduct is still a norm. Need is a radical change in thinking towards acceptance for fellow people of India regardless of cast, colour, religion and gender discremination.